More than 200 Alabama city leaders, county commissioners and others including representatives from Autauga and Elmore counties joined Gov. Kay Ivey last week as she officially kicked off a year-long effort to ensure Alabama reaches maximum participation in next year’s census. 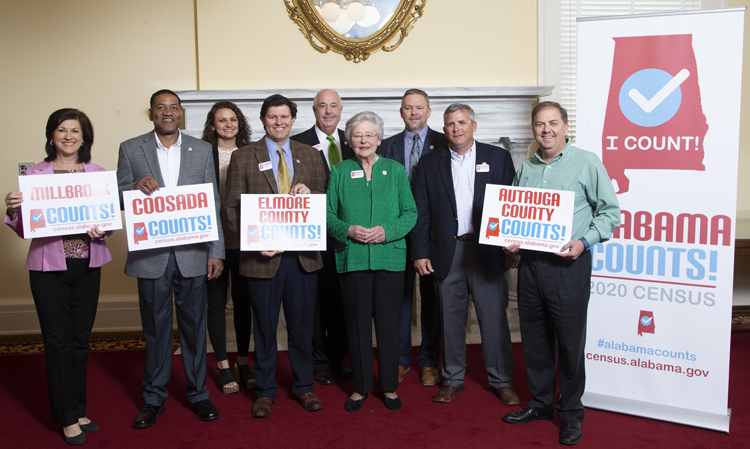 The Alabama Counts event at the state Capitol was conducted one year in advance of the 2020 Census to bring awareness of the importance of the count. The program also served as an avenue to unveil the Alabama Count’s census logo, introduce the theme of “I Count” and premier the state’s census website: www.census.alabama.gov and social media accounts. A low count could result in Alabama losing federal funds relating to health care, education and roads and transportation, rural development and community programs. Many projections have Alabama at-risk of losing a Congressional seat to another state as a result of the census. Members of the Alabama Counts 2020 Census Committee were also recognized by Ivey. The committee was created last summer by executive order under Ivey and is made up of an across-the-board representation of Alabama involving education, rural communities, faith-based organizations, business and industry, community-based groups, health care agencies and governments with the intention of reaching all sectors of Alabama to encourage census participation. The committee is chaired by Kenneth Boswell, director of the Alabama Department of Economic and Community Affairs. ADECA serves as the governor’s liaison to the U.S. Census Bureau and is leading the initiative at the state government level. Beginning in mid-March 2020, Alabama households will receive a letter from the U.S. Census Bureau with instructions on completing 2020 census forms. The Census Bureau is encouraging an online response but will have a toll-free number for households to complete their information over the phone or request a traditional paper form. The Census Bureau plans to mail paper forms to households in rural areas with potentially low internet access. The information collected during the census is confidential and cannot be used against a person by any group or agency.